With sedation dentistry, there is no reason to ever fear a trip to the dentist. At James I. Armbruster, D.M.D., in Sterling, Colorado, we use the latest techniques to make sure your dental care experience is comfortable, fast, and relaxing. For many anxious patients, sedation dentistry offers a convenient, easy solution to stressful office visits. We use a combination of anesthetics to ensure your treatment is performed more comfortably than you ever would have imagined. You'll still be awake, but you'll be drowsy and unaware of the passing of time. Before performing procedures, we numb the tooth and surrounding tissue with the same medication you would receive to numb a tooth prior to having a cavity filled. In addition to the local anesthetic, you and Dr. Armbruster may decide that a sedative, such as an oral sedative like Valium™, is desired to control your anxiety. Since you will be completely comfortable, we can perform many different treatments in just one or two visits. People who have very busy schedules can reduce their overall dental visits because of sedation dentistry. Whether you are receiving a root canal, having your wisdom teeth removed, or simply getting a filling, we ensure you are completely relaxed to make the procedure as stress-free as possible. 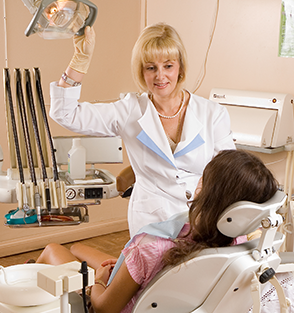 Contact us to make regular dental care a possibility with sedation dentistry.